UPDATED: Fri., Oct. 20, 2017, 11:04 p.m.
HOUSTON – Justin Verlander remained perfect with the Houston Astros, pitching seven shutout innings when they needed him most, and Jose Altuve homered and drove in three runs during a 7-1 victory over the New York Yankees on Friday night that extended the A.L. Championship Series to a decisive Game 7. Acquired in an Aug. 31 trade, Verlander has won all nine of his outings for the Astros. And with his new club facing playoff elimination in Game 6 against the Yankees, the ace right-hander delivered again. After striking out 13 for a complete-game victory in Game 2, Verlander threw another gem. The 2011 A.L. MVP and Cy Young Award winner scattered five hits and struck out eight to improve to 9-0 with 67 strikeouts since agreeing to a trade from Detroit that was completed only seconds before the midnight deadline for postseason eligibility. Game 7 is Saturday night in Houston, with the winner advancing to the World Series against the N.L. champion Los Angeles Dodgers. CC Sabathia is scheduled to start for New York against Charlie Morton in a rematch of Game 3, won 8-1 by Sabathia and the Yankees. The home team has won every game in the series. George Springer helped Verlander out of a jam in the seventh, leaping to make a catch at the center-field wall and rob Todd Frazier of extra bases with two on and the Astros up 3-0. Brian McCann’s RBI ground-rule double in the fifth ended an 0-for-20 slump before Altuve snapped an 0-for-12 skid with a two-run single later in the inning. Altuve hit his fourth homer of the postseason when he connected on a solo shot off David Robertson with no outs in the eighth. Houston improved to 5-0 at home this postseason after dropping three straight in New York as the Astros chase their second trip to the World Series. Saturday will be just the second Game 7 in franchise history after losing the final game of the 2004 NLCS at St. Louis 5-2. The Yankees will have to hope that their elimination-game magic continues when they look to improve to 5-0 this postseason in such games and advance to the World Series for the first time since 2009. Yankees rookie slugger Aaron Judge cut the lead to 3-1 with a homer off Brad Peacock in the eighth. But that came after Judge struck out in two of his first three at-bats to give him 26 this postseason, tying him with Alfonso Soriano for the most strikeouts in one postseason in major league history. Peacock settled down after the homer by Judge, retiring the next two batters, capped by a strikeout of Gary Sanchez to end the inning. Ken Giles finished it off with a scoreless ninth. Houston led the majors in scoring during the regular season, but had struggled in this series, managing just nine runs combined in the first five games. Alex Bregman, who changed his walk-up music to Tom Petty’s “I Won’t Back Down” on Friday, belted a two-run double in the eighth inning to make it 6-1, giving the Astros more runs than they’d managed in their last three games combined. Many in the rowdy crowd of 43,179, which included Roger Clemens and former Rockets great Clyde Drexler, held signs and most fans waved orange towels that were handed out at the door. One woman hoisted a sign that read: “Verlander (equals) Victory” and a little boy clutched one that said: “Justin Time” above a crudely drawn clock. After the Astros got walloped in three games in the Bronx, New York starter Luis Severino kept them off balance early and they didn’t get a hit until a single by Carlos Correa with two outs in the fourth. Bregman walked to start Houston’s fifth before a one-out walk to Evan Gattis. McCann got his first hit of the series with his ground-rule double that made it 1-0 after Houston had gone 15 straight innings without scoring. Severino walked Springer to load the bases before retiring Josh Reddick. Altuve then sent the first pitch of his at-bat sailing just inches over the glove of Frazier, the third baseman, and into left field to make it 3-0 and chase Severino. 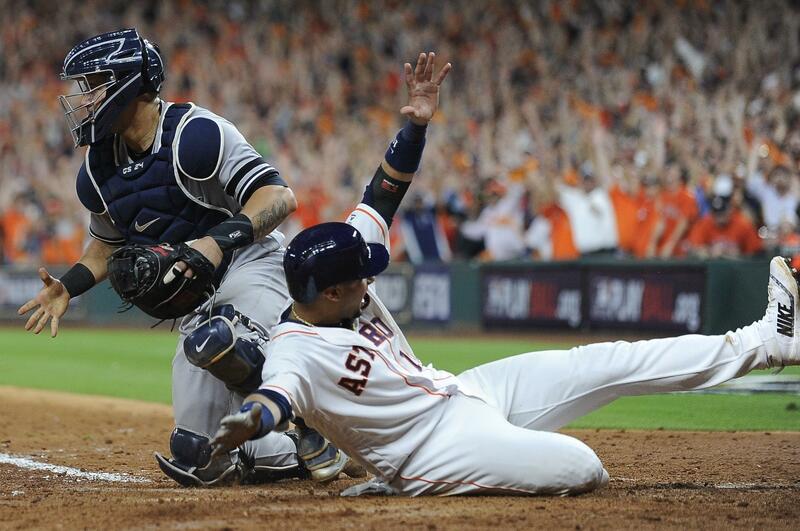 Altuve raised his arms and implored the crowd to get louder as he reached first base, finally breaking out of a rare slump with his first hit since Game 2 of this series. The major league batting champion had failed to get a hit in three straight games just one other time this season. Altuve is 15 for 37 with seven RBIs and six multi-hit games this postseason. Verlander walked Greg Bird to start the seventh before plunking Starlin Castro on a pitch that manager Joe Girardi asked to be reviewed. Aaron Hicks fought through a 10-pitch at-bat before striking out. Springer’s catch came next, and Frazier waved his hand in disgust as a jubilant Verlander pumped both arms skyward. When he got out of the inning by inducing a groundout from Chase Headley, the he hit his hand into his glove and screamed. Verlander improved to 4-1 with a 1.21 ERA in five career postseason elimination games and ran his streak of scoreless innings in such games to 24 innings. Severino yielded three hits and three runs while walking four in 4 2/3 innings during his fourth playoff start. He lasted longer than he did in his previous outing, when he was pulled after four innings in New York’s 2-1 loss in Game 2. Yankees: Sabathia allowed three hits over six shutout innings for the first scoreless start of his postseason career in Game 3 at Yankee Stadium. He is 10-0 this season following a Yankees loss, including the playoffs. Astros: Morton was picked to start Game 7 over Peacock, who pitched in relief on Friday, and Lance McCullers Jr., who threw well in his Game 4 start but would be working on only three days’ rest. Morton was unlucky in his Game 3 outing, when he gave up several soft hits and a three-run homer by Frazier to the opposite field. The right-hander was charged with seven runs and six hits in 3 2/3 innings. Published: Oct. 20, 2017, 9 p.m. Updated: Oct. 20, 2017, 11:04 p.m.